For a unique and casual dining experience, this eight-person traditional raclette grills small pieces of meat, seafood, and vegetables, as well as the traditional Swiss cheese dish known as raclette, right at the table. This special way of tabletop cooking has been around for centuries, and the grilling possibilities are endless. 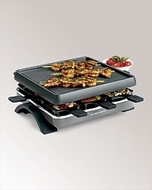 The square-shaped unit features variable temperature control, a nonstick grill with an eight-tray heating section, and dishwasher-safe parts for quick and easy cleanup. Recipes and eight heat-resistant cooking paddles are included. Black with silver accents. Size: 16.5" x 7.12" x 15.5"